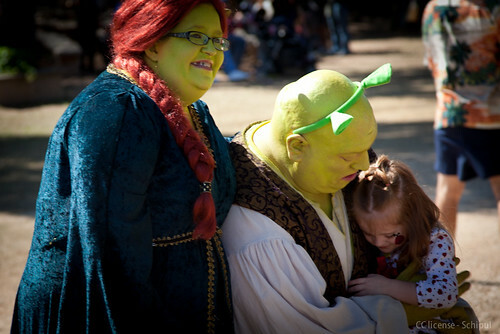 the most beautiful moment at the renaissance festival. EVER. I started going to the Texas Renaissance Festival in either 1987 or 1988 while going to Texas A&M as an undergrad. I can’t recall the exact date. I went many times, but it was college so that might have been three times in one year or two times each year, or who knows. It’s lucky I remember my own name from 20+ years ago. Or to more accurately state it, a tiny 3 or 4 year old little girl propelled herself out of her parents arms like an Olympic athlete and flew above the ground like a hydrofoil to Shrek. It was kinda like the “human torpedo” move in WWE. Shrek knelt down on one knee and caught her. The young’un quickly buried her head against his enormous frame. The giant man, in costume of course, brought her to a safe position and looked up at her parents for approval. Mrs. Shrek right next to him. The parents of the star of our story 5 feet away nodded approval and smiled. Myself 20 feet away dumbstruck. And all of us were frozen. We froze watching this beautiful young lady who completely believed not only in Shrek, but that THIS was SHREK. And she loved him. It looked like this photo I took after I snapped out of it. I can’t really explain it. It was just beautiful. It was respectful. The parents were smiling ear to ear. The actor-volunteer-Shrek was well aware of a responsibility that I had no idea he had; to represent honorably the image of Shrek and the dreams of little kids. The shrek-hug was the most beautiful thing I have seen all year. God bless you Shrek. And God bless this child and her family for their wisdom to allow her to have this moment. And thank you that I was there with my family to witness it. ‘Cause my kids are pretty awesome too IMHO.